This year, we've had the opportunity to try hundreds of ATX places and products and meet dozens of local business owners. We’re excited to share this list of our favorites to help you give a taste of Austin to everyone on your list. Silk Diaries offers one-of-a-kind batches of botanically dyed silk to empower women in the workplace. Founder Kylee uses silk to represent the unparalleled strength and softness that exists in the femininity of woman-kind. The Darla scarf is made of 100% habotai silk and bundle dyed with natural materials in small batches. It’s light weight with a slight sheen making it the perfect accessory to cap any outfit during any season. We love that each scarf is one-of-a-kind, which guarantees you’re giving a unique gift. When Ashley Green- the owner of Frankie Jean- was young, her mom always had a knack for connecting people and would create a after-school group or small side business to meet their needs. So when Ashley saw the need for artisans to have a platform that helped them launch their own small business, she created Frankie Jean- a lifestyle brand focused on encouraging artists in their endeavors and giving them a platform to begin or further their reach. Anna creates custom watercolor prints, maps, and other items inspired by Austin. She also does custom pet illustrations for the dog lover on your list. The husband and wife team behind Highway Robery, Evan and Jackie, want you to feel cozy and carefree. Which is why they produce small-batches of kimono-style robes using colorful prints on pre-existing fabrics. Their robes make us feel like the queens of Marfa or rockstars on our couch. Glam, comfy, fun— perfect combo for the holidays! Fine Southern Gentlemen delivers unique, Southern-inspired clothing and custom-printing. They’re all about design + good times. It was hard to choose just one thing we love from FSG. From hats to tees to flags, they always put out edgy prints with a distinctly Austin vibe. 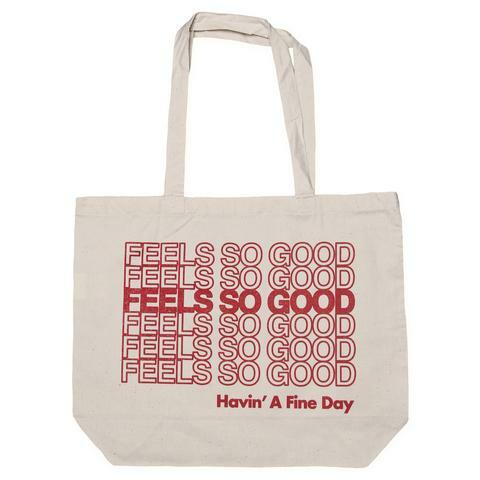 At the end of the day, we chose the tote because it always brings a smile to our face every time we’re unpacking the groceries. Yellowbird is not your typical watered–down hot sauce. Their spicy condiments are flavor–forward with a thicker, smoother consistency packed with real, farm–fresh fruits and vegetables. They believe in spicy condiments with spunky character. After trying their (incredibly tasty!) full sauce line-up, the serrano became our instant favorite. Cucumbers and carrots balance out the serrano pepper, making it the “just right” amount of heat and perfect to top everything from breakfast tacos to rice bowls. Want more variety? Gift their full 5-sauce variety pack. Hey Girl Earrings exists to eliminate the gap in digital skills while empowering women, one pair at a time. They partner with women-focused non profits to teach coding skills, e-commerce, search engine optimization, digital marketing and more - all critical components to launch successfully into tomorrow's job scene. At ROX, helping people is the number one priority. They make high-quality unique jewelry and apparel and donate a portion of every sale to the charity of the customer’s choice. We like rockin’ the Girl Gang tee from their Empowering Women Collection because it reminds us of the community of inspiring women we’ve found through our atx&o interview series, like #WCW. #GirlPower. The Cupcake Bar creates interactive dessert experiences, blending entertainment and indulgence. From cupcakes to doughnuts to caramel apples- they handle your sugar fix from start to finish! The Holiday Cupcake Kits are a fun way to bring The Cupcake Bar world to you! Each cupcake kit includes 6 naked cupcakes, 3 icings, 3 toppings, a spatula and a fun instruction sheet for you to create your custom cupcake. Snag a few kits to bring some holiday cheer to your office or to a holiday gathering. Pairing unique Guatemalan textiles with high-quality leathers, arloom collaborates with artisans to design and produce a collection of one-of-a-kind handbags, jewelry and accessories. arloom isn’t only about creating beautiful products; owners Alex and Robin Hewes also focus on helping to sustain cultural traditions and provide economic opportunities for indigenous people in Central America. Our arloom clutch is one of our favorite purchases of 2018. We’re extra excited for the release of their Morgan backpack and Virginia Cards Wallet (both launching 11/29!). Packed Party is a lifestyle gifting company that aims to make everyday a party. Nothing brings the fun like their first-ever disco drink™. Perfect for hot and cold beverages, these party cups make us feel like rockstars at any occasion. Noah Marion is a contemporary design house dedicated to producing quality products for everyone with a focus on craftsmanship and longevity. Our favorites? The monogram-able coasters, luggage tags and folios- all handmade leather goods from the finest cowhides around. The folio is intended to be used to carry your laptop or anything you fancy and is hand stitched and hand cut. Take your luggage tag with you around the world; it's worth it! And the coasters are great thick leather that just get better with age. Outdoor Voices is the technical apparel company behind all the #DoingThings hats and color blocked workout wear you see around town. They’re about getting moving and having fun. We first hopped on the Outdoor Voices train with the Venus Crop, and after wearing it on a long hike in Denver, we’re super fans. The fit was perfect without compromising one thread of cuteness AND it stood up against the summer heat. Definitely recommend snagging one for your ClassPass buddy and one for yourself. Succulent Native is Austin’s Succulent Florist. They focus on making things adorable & affordable for your budget. Their gift box set is no exception. It includes one of each of their favorite goodies- $20 cactus or succulent arrangement + sugar scrub + cactus candles + handpainted cactus plate. Add on their fancy mister for an extra special set. Slow North intentionally crafts all-natural, botanical products made to complement whole living. A family business, Slow North emerged from the belief that all home goods, whether luxury or necessity, should be made with clean and safe ingredients. Merry + Bright is a custom blend of northern fir, clementine and clove essential oils - designed to cheer and uplift your senses - is warm and inviting; with notes of your local tree farm and a cozy, spiced citrus undertone. Northern Fir carefully sources and thoughtfully crafts all-natural and outdoors-inspired handmade grooming products with proven results to help you look, smell and feel your absolute best. Their grooming set includes a 1 oz bottle of our signature Beard Oil and a 2 oz tin of our Beard Balm, and a handmade American Walnut and Maple Wood Keychain Comb. We love how good their products smell! Becca Borrelli is an illustrator, coloring book artist, and muralist, partnering with clients to tell stories and market themselves through whimsical art. Her digitally hand-drawn adult coloring books showcase iconic Austin spaces. We’ve had many lazy Sundays well spent with Becca’s coloring books. They’re also a great gift for anyone who recently moved to ATX to help them explore the city! Ravishing Lather’s mission is to inspire others to spread joy and cheer by providing the community with artisan body care and candle products that evoke self care rituals. They believe self care is crucial for people to be productive in a positive way in their daily lives. Handcrafted and made from activated coconut shells, this soap can act as a mask that draws out impurities while exfoliating. Art & Soul Design, run by a mother-daughter duo, is a Contemporary Botanical Studio and Natural/Artisan Boutique featuring over 40 indie makers, designers and artists (90% local) with a focus on slow and intentional living. 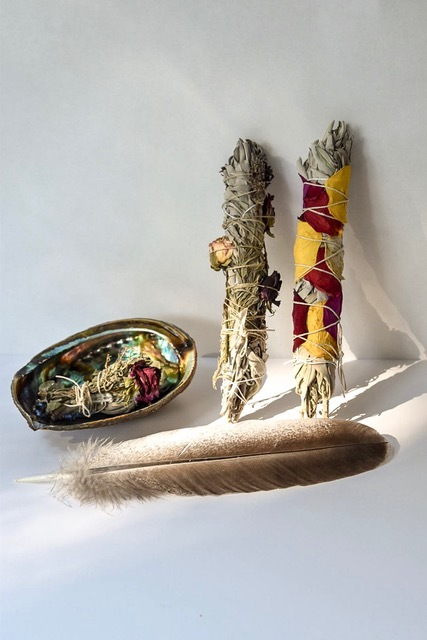 The smudge kit includes one each of their signature Floral Sage Smudge Sticks. Made from ethically and sustainable sourced materials, each element is represented in this modern take on a traditional kit: Fire/Earth (the herbs & igniting them) Water (abalone shell catch dish) and Air (turkey feather for fanning). If you buy in-shop, enjoy the free Foraged & Found Gift Wrapping Bar, which includes all of the basics plus a variety of natural elements and botanically dyed ribbons.